Aortic stenosis is a narrowing of the aortic valve, the outflow valve of the heart between the left ventricle (main pumping chamber) and the aorta (major blood vessel carrying blood to the body). The aortic valve normally functions as a 1-way valve that prevents blood from leaking back into the heart. When the aortic valve narrows, the heart has to work harder to pump blood into the aorta. Aortic stenosis is caused by stiffening of the 3 valve leaflets, restricting its ability to open normally. 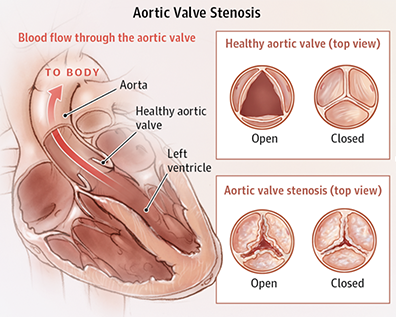 Aortic Stenosis can also be a result of a Bicuspid or congenitally abnormal valve. Aortic stenosis typically develops in individuals older than 65 years but can also develop in younger individuals who are born with an abnormal valve or develop rheumatic heart disease. Symptoms of aortic stenosis include chest pressure, lightheadedness or fainting, breathlessness, and/or fatigue. They indicate that the extra work required to open the valve has overcome the heart’s ability to work normally. Aortic stenosis is a slowly progressive disease. Many patients never develop symptoms and thus never need to have the valve replaced. However, when symptoms develop or the obstruction becomes very severe, expeditious diagnosis and treatment are critical. Aortic stenosis is often first diagnosed when a physician hears a heart murmur, caused by blood flowing rapidly through the valve (similar to a tight nozzle on a hose). More reliable diagnosis is made using echocardiography to image the heart’s structure and function and to measure the speed of blood traveling through the valve. Other tests include cardiac catheterization, a procedure in which small tubes (catheters) are inserted into blood vessels and passed directly across the valve to determine its tightness, and imaging tests such as computed tomography (CT) or magnetic resonance imaging (MRI). Medications are usually not effective in treating aortic stenosis as this is a mechanical problem, and valve replacement is the only proven therapy to improve symptoms and prolong life. Minimally Invasive Surgery to replace the aortic valve has been an effective and durable treatment for aortic stenosis for decades. In this operation, a heart surgeon removes the narrowed valve and replaces it with either a tissue valve (from a cow, pig, or human) or a mechanical valve. Transcatheter aortic valve replacement (TAVR), a less invasive procedure, has emerged as a preferable option for patients in whom open-heart surgery poses risks. In TAVR, the new valve is inserted using a catheter without the need for open-heart surgery. Rather than replacing the valve, as is done with surgery, the TAVR procedure inserts a new valve inside the old aortic valve, pushing open the narrowed leaflets and relieving the obstruction to flow. If you have been diagnosed as having aortic stenosis, you should consult with a cardiologist, who can advise you of your options. Fortunately, there are more options for patients with this disease than ever before.